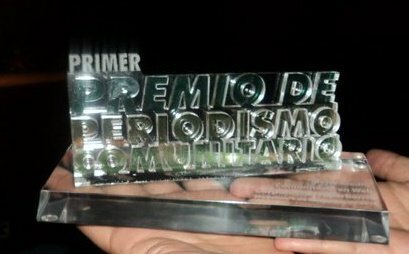 Last Wednesday HiperBarrio from Colombia won the First Community Journalism Award in Municipality of Medellín by Antioquia University in the category of Best Community Web platform. In this award Antioquia University highlighted the works of press, radio, audiovisual and the digital media. 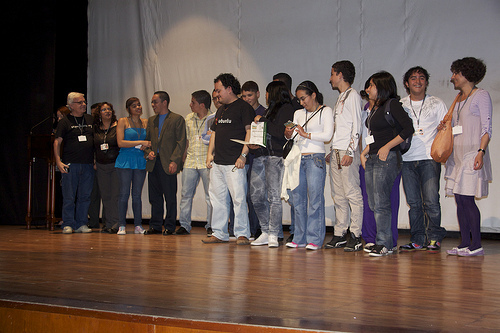 The Mayor of Medellin presented the awards. HiperBarrio will also receive 6 million Colombian Pesos along with the award. The event was attended by a large group of members HiperBarrio, especially the HiperBarrio-Villactivos that took the stand en-mass to receive the award. These awards have enabled many to see that it is possible to be heard, that dreams are just that, are realities that await their time to perform, grow and strengthen as the fruit of a tree, by being accessible to those in need, these grow daily. And it is expected that each fruit is picked with gratitude. More photos of the award ceremony can be found in this Facebook page of Kelly Munera or the HiperBarrio's photostream in Flickr. Anderson Valencia gives credit [es] to the HiperBarrio team for this feat. You might wonder what kind of community journalism the members of HiperBarrio are carrying out. If you read our features on the project regularly you will have an idea. Or you can look at Gabriels's post [es] about a missing citizen of La Loma, or the growing number of armed gangs [es] spreading fear among the citizens. In the towns of Medellin not only there are echoes of bullets and cries, one also hears the sounds and arpeggios of great talents. When the press and we insist on highlighting the violence and do not we realize that we ended up overshadowing the presence of many anonymous people, that despite many difficulties struggle to transform their reality and their communities. With this video we want to emphasize that it is better to take up an instrument or a book than a weapon. We emphasize the work of virtuoso Juan David Roldán Villatina neighborhood a young brave with his cello makes a sound of hope. Here is a reaction [es] of a participant, who took part in the trainings provided by HiperBarrio. Note: All excepts were translated from Spanish with the help of machine translation.